As an All-Star Rewards Member, you can enjoy the following exclusive special offers at our golf partner courses and facilities. Take advantage of discounts on greens fees, carts, lessons and more. Remember to mention you are an All-Star Rewards member when you make your tee time. You must present your All-Star Membership card when you arrive in the pro shop prior to play. The toughest drive you will have all day is the one leaving. For more information about Basin Harbor Club or to schedule your tee time, call 802-475-2309 or visit www.basinharbor.com. Green Mountain National Golf course in Killington offers a great Vermont golf experience for all ability levels. All-Star Rewards Members receive $20.00 off 18-hole greens fees all week long! For more information about Green Mountain National Golf Course or to book your tee time, call (888) 483-4653 or log on at www.gmngc.com. Surrounded by the lush Kedron Valley and stunning views of Mount Peg, the golf course at Woodstock Inn & Resort is a picturesque venue for all levels of golfers. The premier 18-hole course, designed by Robert Trent Jones, Sr. and listed as one of the top 100 golf resorts by Golf Magazine, boasts a par 70 design, with signature challenges that include water hazards, bunkers, and twisting fairways. Woodstock Country Club offers many golf & stay packages throughout the season from Unlimited Golf – yes play as much golf as you want – to an Introductory Golf package or even our Golf & Spa package with a $100 spa credit. View all of their specials today! For more information about The Woodstock Country Club or to schedule your tee time, call (802) 457-6674 or visit www.woodstockinn.com/golf-club. Eastman Golf Links is not the hidden gem anymore. We are front and center to golfers from the Upper Valley, New England and across the country. The New England Golf Guide 2014 edition rates Eastman Golf Links as a 4-star golf course. There are only three such courses in New Hampshire. You will feel totally away from the crazy world when you are spending the day with us. You bring the spirit and we bring the simplicity. Oh, sweet course conditions, too. For more information about Eastman Golf Links or to schedule your tee time, call (603) 863-4500 or visit http://www.eastmangolflinks.com. PGA Professional Peter Harris offers private and group lessons upon request. Beginner and junior clinics also available throughout the season. To learn more about rates or to register for a lesson or clinic, please contact Peter at (603) 298-9702. 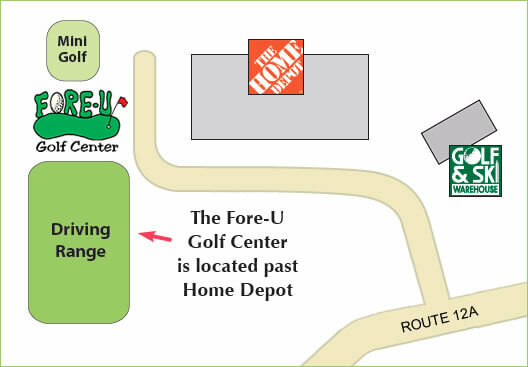 Fore-U Golf Center is located on Route 12A in West Lebanon, NH at the back of the Golf & Ski parking lot, behind Home Depot. For more information please call (603) 298-9702 or visit www.foreugolf.com. Hanover Country Club, located on the campus of Dartmouth College, is a college-owned, semi-private golf course open to the public. Home to the men’s and women’s Dartmouth College golf teams, Hanover provides a challenging layout for players of all abilities. Situated in the rolling hills of Hanover, NH, the course offers a unique blend of holes, both short and long, uphill and downhill, tree lined and open. Make sure to bring your best putting stroke with you; Hanover’s greens are fast, smooth and undulated. For more information about Hanover Country Club or to schedule your tee time, please call (603) 646-2000 or visit golf.dartmouth.edu. The Mount Washington Course was voted Golfweek Magazine’s Best Course You Can Play in NH from 2009 – 2015! For more information, visit www.brettonwoods.com/activities/golf/overview. Call (603) 278-GOLF (4653) to reserve your tee times today. Nippo Lake’s unrivaled scenery, meticulous landscaping and abundant wildlife provide the perfect backdrop to your round of golf, lesson or practice time on the driving range. Nippo Lake Golf Club is a Par 70, 18-hole public course overlooking the Blue Hills Range in Barrington, NH. The unrivaled scenery and design of each hole provide a serene yet challenging golf experience for those just taking up the game to the most experienced golfer. All-Star Rewards Members enjoy a special 18-hole rate for two golfers! For more information about Nippo Lake Golf Club or to reserve your tee time, please call (603) 664-7616 or visit www.NippoLake.com. For current golf rates, please visit www.overlookgolfclub.com/-rates. To reserve your tee time, call (603) 465-2909 or book online at www.overlookgolfclub.com. From the 6,687-yard championship tees to the 5,187-yard forward tees, Rochester Country Club’s par 72 course offers four tee locations to challenge players of all handicaps. Rochester C. C. is a public, 18-hole, par-72 golf course located on a 150-acre site nestled along the Cocheco River, offering beautiful views of our pastoral countryside. This is truly a very special place to play that ANYONE can enjoy. Bridgton Highlands is a fun and friendly, open-to-the-public golf and tennis facility located in the heart of Maine’s Lakes Region with a range of activities for men, women, couples and youth. Their 18-hole layout provides a challenging and enjoyable golf experience in a scenic setting – the best in western Maine with views of Pleasant Mountain-Shawnee Peak, New Hampshire’s White Mountains and Mount Washington — where you can leave distractions behind and focus on your game. To learn more about Bridgton Highlands or to book your tee time, please call (207) 647-3491 or visit bridgtonhighlands.com. This links course is situated on over 200 acres of rolling countryside in south Auburn, Maine, and is designed to take advantage of the natural lay of the land which will demand every shot in your bag. To learn more about Fox Ridge Golf Club or to book your tee time, please call 207-777-GOLF (4653) or visit foxridgegolfclub.com. Tucked away in a secluded locale just off Maine Turnpike’s Exit 75, Martindale Country Club, a private course for over 90 years, is now semi-private and open to the public. Known for having the best greens in the area, the 18-hole championship course also features four sets of tees for all ability levels. On the front nine, you’ll enjoy amazing views of Mount Washington… while on the back nine, you will relish the natural beauty of the Little Androscoggin River. The playing conditions are excellent, and the staff is committed to providing superb service. For more information or to reserve your tee time, call 207-782-1107 or log onto www.martindalecc.com. To reserve a tee time or for any other general information, please call (207) 883-0007 or visit www.nonesuchgolf.com. One of Maine’s finest golf courses! Four sets of tees, 18 beautifully designed holes and generous landing areas accommodate golfers of all skill levels. Located in Sanford, Maine, Sanford Country Club, a semi-private club, is conveniently located near Kennebunkport, Wells and Portsmouth. Its historic 18-hole golf course, which played host to the 2012 US Amateur Qualifying Round, has welcomed golfers such as Byron Nelson, Lloyd Mangnum, Francis Ouimet, Ben Hogan, Sam Snead and Gene Sarazen. With four sets of tees ranging from 4900 to more than 6700 yards and a robust golf education program, Sanford is home to families, women, juniors, novices, veteran players and the local Sanford High School Golf Team. To learn more about Sanford Country Club or to book your tee time, please call (207) 324-5462 or visit sanfordcountryclub.com. Home of 3 USGA Massachusetts Opens and the annual host of the Cape Cod Senior Open golf tournament, Cape Cod Country Club is proud to be always open to the public. For current 2015 golf rates, visit www.capecodcountryclub.com/-rates. To reserve your tee time, call (508) 563-9842 or visit www.capecodcountryclub.com.